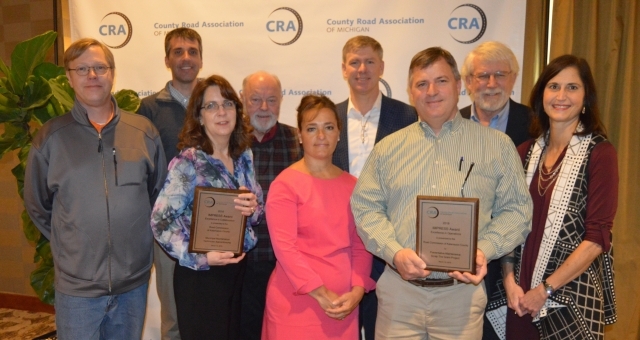 LANSING, MI – The Road Commission of Kalamazoo County (RCKC) took home two IMPRESS Awards at the County Road Association (CRA) of Michigan’s statewide 2019 Highway Conference in March. IMPRESS awards recognize county road agencies that demonstrate innovation with special projects in communications, operations and collaboration. RCKC worked collaboratively with the Teamsters Local 214, the US Department of Labor, Michigan Human Resources Development Inc. (M-HRDI) and Michigan Works! Southwest to develop an apprenticeship to benefit the skilled trades in Southwest Michigan. For Operations, RCKC used two experimental road treatments using scrap tires: hot mix and asphalt paving. More than 13,500 scrap tires were used, and RCKC believes this has much potential for future processes and market development. An independent panel of communications and operations experts from several of Michigan’s 83 county road agencies judged the projects. Award recipients were honored for projects that solved time restraints, labor costs, communication barriers and fostered collaboration. The 83 members of the County Road Association of Michigan represent the unified voice for a safe and efficient county transportation infrastructure system in Michigan, including appropriate stewardship of the public’s right-of-way in rural and urban Michigan. Collectively, Michigan’s county road agencies manage 75 percent of all roads in the state, including 90,000 miles of roads and 5,700 bridges. County road agencies also maintain the state’s highway system in 64 counties. Michigan has the nation’s fourth-largest local road system. Copyright © 2019 County Road Association of Michigan, All rights reserved.